Kaela Mei-Shing Garvin and Patricia Sabulis in Ambition. BOTTOM LINE: It's billed as "the female American serial killer musical," but it's much more intimate, and less definitive, than that phrase implies. Ambition is an apt title for Kaela Mei-Shing Garvin’s new musical, which weaves together the true stories of three female serial killers. 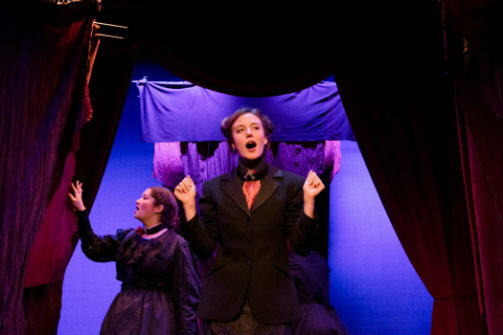 Each member of the three-woman cast plays one of the central figures, as well as several other characters, as we jump back and forth in time and space. There are themes common to all the women’s stories: miserable childhoods, class prejudice, relationship drama. The tales are fascinating, but do they all belong in a play (or a musical) together? Belle Gunness (played by writer Garvin) is a 19th-century Norwegian immigrant who did a lot of digging behind her Indiana farmhouse; Jane Toppan (Patricia Sabulis), Belle’s contemporary, is a hypodermic-happy Boston nurse; and Nannie Doss (Kineta Kunutu) is an early 20th-century hillbilly housewife mysteriously widowed (and otherwise bereaved) multiple times. Between scenes depicting the humiliation and abuse these women suffered at the hands of family and society are musical numbers, with instrumentation provided by "rustic-electropunk trio" the Gandor Chorale. These inject dark humor into the piece, as the murderesses offer the audience treats that may or may not be poisoned and “make it rain” with the money they acquired as a result of their crimes. Interestingly, the play only follows their stories so far, denying us the closure of seeing them stopped or apprehended; it’s clear that Garvin’s focus is on the emotional drama rather than a straightforward plot. It’s impossible to watch Ambition without comparing it to Assassins, Stephen Sondheim’s musical about those who took aim at the president(s) of the United States. This work is on a much smaller scale in every sense; that said, it could take some cues from its predecessor which creates (imaginary) relationships among its titular killers to enhance the drama. In spite of the obvious similarities between Gunness, Toppan and Doss, their stories seem more strung together than linked. The songs don’t do much to solve that problem; in fact, I found myself wondering whether Ambition should be a musical at all, given that its dramatic scenes are so much more compelling than its score. Director Lauren Z. Adleman keeps the cast moving smoothly and efficiently through their many changes of scene and tone. Ultimately, Ambition is sometimes intriguing, sometimes clumsy, and consistently keeping with its title. It’s somewhat less than the sum of its parts, but some of those parts will make you think twice about the seemingly normal lady next door. Ambition is by Kaela Mei-Shing Garvin. Directed by Lauren Z. Adleman. Produced by Rebecca Russell. Musical Director is Cameron Toy. Lighting Design is by Eric Mercado. Costume Design is by Barbara K. Begley. Scenic Design is by Anastasia Romantsova. Choreography Consultant is Ryan VanDenBoom. Stage Manager is Jaye Hunt. The cast is Kaela Mei-Shing Garvin, Kineta Kunutu, and Patricia Sabulis.